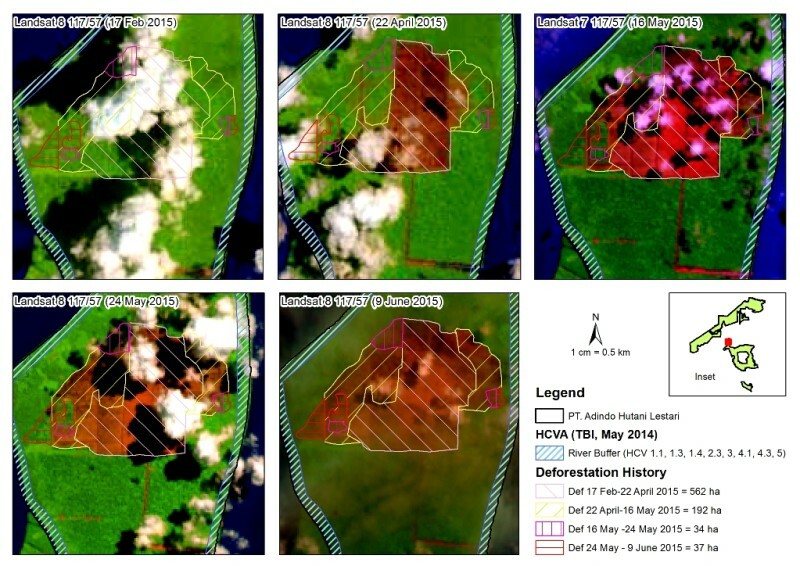 Landsat satellite images (see images below) of the PT Adindo Hutani Lestari (AHL) concession taken on 16 and 24 May and 9 June show forested peatland being cleared after 15 May 2015, the day by which APRIL promised to halt all their suppliers’ forest clearance (see Map below). The clearing may still be happening today, NGOs warns. or forested peatland.” The area’s peat is supposed to be more than 2 meters deep, potentially protected by law. Adindo Hutani Lestari had already continued to violate APRIL’s initial SFMP 1.0 since it had been published in January 2014 by continuing to clear natural forests on peat without proper HCV assessment, partly in violation of government laws and regulations. “Our continued monitoring of AHL’s violations and increasing pressure by many NGOs prompted APRIL to improve its forest policy and commit to a forest clearance moratorium by all suppliers,” said Kamiruddin from Gapeta Borneo, a non-governmental organisation along with WWF-Indonesia East Kalimantan Program monitoring performance of APRIL as they started last year. “However, the reported violation of the moratorium from its very beginning makes us skeptical about the company’s latest promises. It appears to be business as usual for APRIL,” Kamiruddin said. “In Riau Province in Sumatra, APRIL had continued to clear natural forest on peat in violation of its first, much weaker SFMP. APRIL conveniently managed to clear all the forest they could before they published their updated SFMP this year” said Woro Supartinah of EoF coalition in Riau. “We hope APRIL does not do the same thing with AHL concession which shows a constant violation of its own sustainability policy. We call APRIL and AHL to stop forest clearance immediately,” she added. GAPETA Borneo, RPHK & WWF-Indonesia-East Kalimantan Program (20 May 2014) BAHASA INDONESIA: Penebangan Hutan Alam Gambut Dalam Berlanjut di Perusahaan Pemasok APRIL. Komitmen lestari APRIL dipertanyakan, Hutan Bernilai Konservasi Tinggi (HCVF) ditebang. / ENGLISH: Natural Forest Clearance Continues on Deep Peat in APRIL Supplier Concession. APRIL’s sustainability commitment questioned, High Conservation Value Forest cleared.